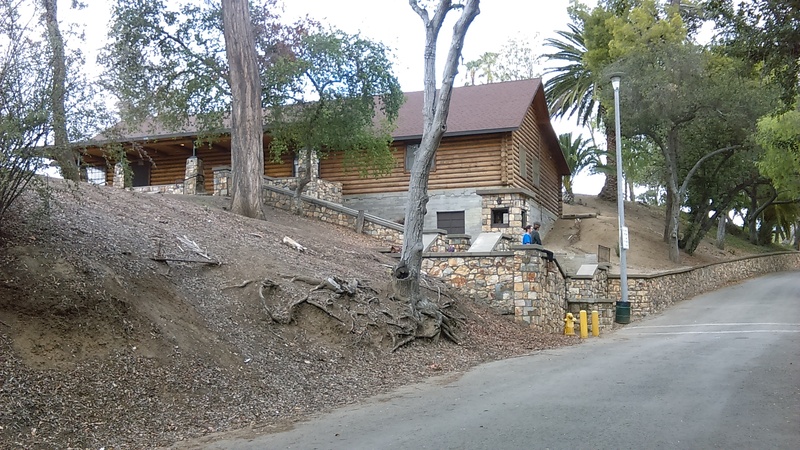 This webpage has a great deal to say about the park itself, so if you are here just to get information about the walk that leads out from Hillcrest Park, hit the Page Down key five or six times. 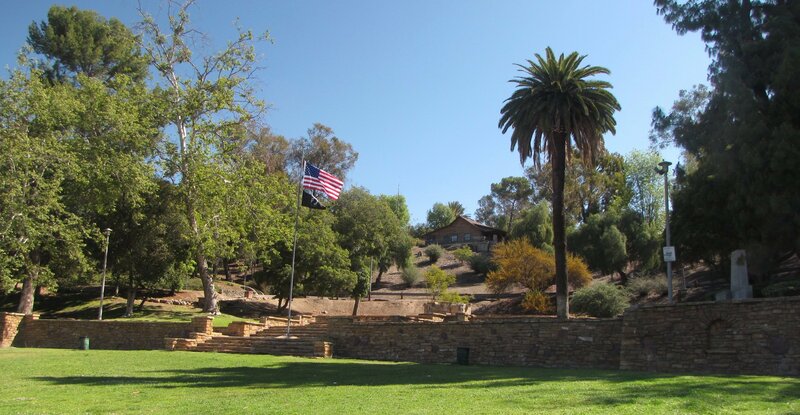 Hillcrest Park is Fullerton’s most visible park. It was host to a controversial upgrade in 2017. The 4 million dollar improvement will indeed make the park’s beauty more visible but in evaluating whether it was worth the money or not, keep in mind that an important purpose of a park is how it makes you feel about the city as you drive by; as millions of us drive by. Hillcrest Park is clearly Fullerton’s show piece park because it is so visible. It is green with trees and the land is tilted up so it can be seen by cars on the busiest street in town. (The other parks surround a natural creek which means they are all below the street level.) The features of this park includes monuments, BBQs throughout, a club house that can be rented, rest rooms and picnic tables. There’s an area for a party of a 60 or more. There’s the famous “wood exercise stairs” on the north as well as two very old decorative stone stairs in the middle for exercise. There’s a paved road which snakes throughout the park but rarely used by cars so they are safe to walk on. For walkers who prefer dirt trails, there are some of those too. They are to the west of the wood exercise stairs. More on those below. Auto Camp Fullerton. It doesn’t look it, but this was middle class vacationing in the 1920s. Some Interesting History The earliest interesting feature was in 1927 when the city ran an “auto camp” where the fountain is now. The pricing structure for this was quite interesting. The first three days, free. After that it was 50 cents a night. That is a about $14 in today’s money, so it would seem that it was priced to encourage short visits. 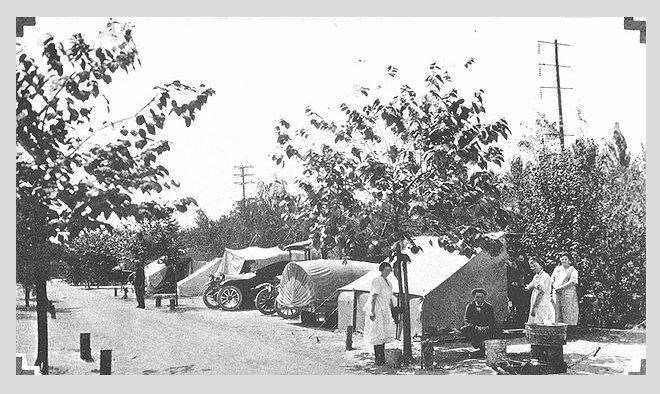 Auto camps were the predecessor to motels and common throughout the country in the 1920s. It was a service to tourists to get them to have your town as a destination. It should be pointed out that although there were homeless in those days, owning a car was a middle class luxury. They were roughing it for pleasure, not necessity. Duck Pond In Hillcrest Park Fullerton. Click on the Duck Pond Today in the gallery below. The architect of that auto camp and the Hillcrest Park itself was Johann George Seupelt. (He designed and supervised other parks and the layout of some of the schools. Later he became the Parks Department Superintendent; the first one with that title.) Seupelt entered his Hillcrest Park plans in a Southern California landscape competition where he won first prize. He was a consultant on similar projects in Anaheim, Brea and Placentia. The 33 acres that is now the park was purchased from an individual for $67,200 in 1920. (That’s a bit less than million dollars today.) Other small parcels were purchased with in a year of that. One of those parcels was 2 acres at the very top which became a large water tank; Five million gallons. So big it was called a reservoir back then. 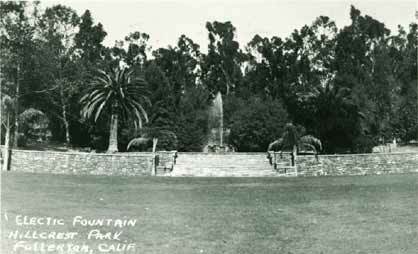 The fountain when it was new in 1930. There was only 4,415 residence at that time. The investment in that park (a million in today’s money) was over $200 (today’s money) a person. Would you do that much for Hillcrest Park today? (The present improvement, divided by 135,000 people is only $40 a person.) There was a park improvement program done during the New Deal where several three letter acronym programs employed 144 people to plant 4,000 trees in the park and along various nearby streets. About 50 men for three months built the fountain; the very one being restored now. The WPA work can be seen today in the brown flagstone stairs and decorative pillars throughout the park. Izaak Walton League Log Cabin. The Izaak Walton League has an interesting relationship with the Parks Department. They built it, then gave it to the city for use by any club, wedding or memorial service. The conservation club built the log cabin in 1931 and it has been rebuilt twice since then. 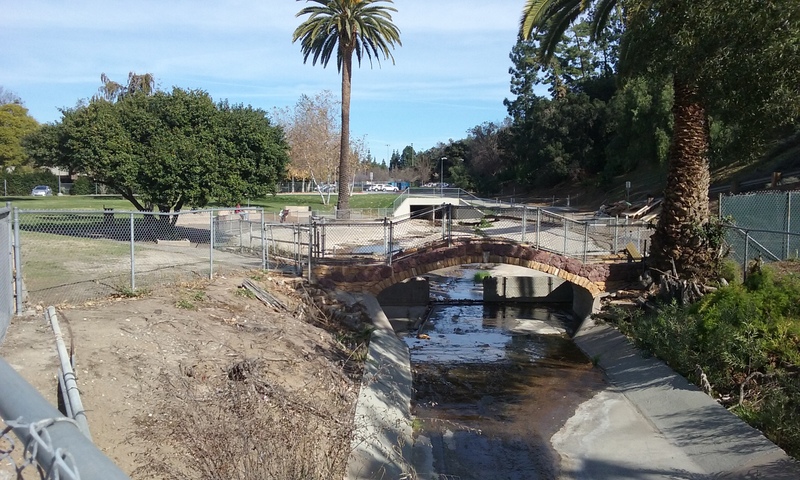 The Izaak Walton League is still going strong promoting conservation: https://sites.google.com/site/californiadivision/fullerton-chapter For 80 or so years it has been hidden from view but in the recent drought trees died and have been removed so that it now can be seen prominently from Harbor Blvd. ____The park was host to a Tent City on two occasions; the 1933 earthquake and the 1938 flood. Most likely only the land was made available for free. The tents, and provisions were purchased by those that suffered the loss. In the days before building codes it was the middle class homes that were destroyed not just the homes of the poor. There was still employment and people had savings and insurance. 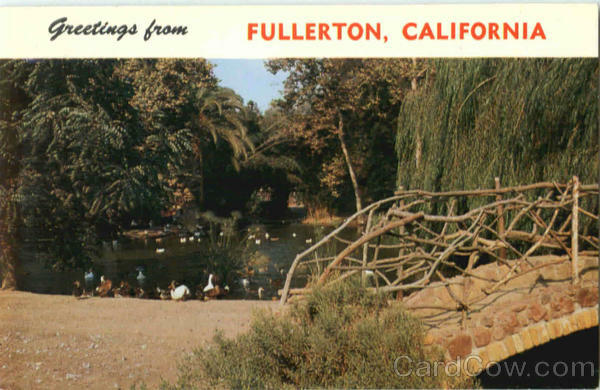 For more on the history of Fullerton see the Launer Room at the library. 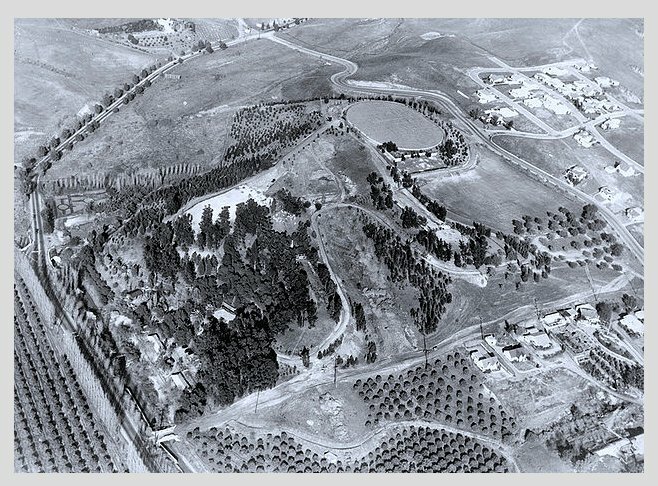 Aerial photo 1940s showing water tank on top of Hillcrest Park. Its the elliptical structure in the upper right. 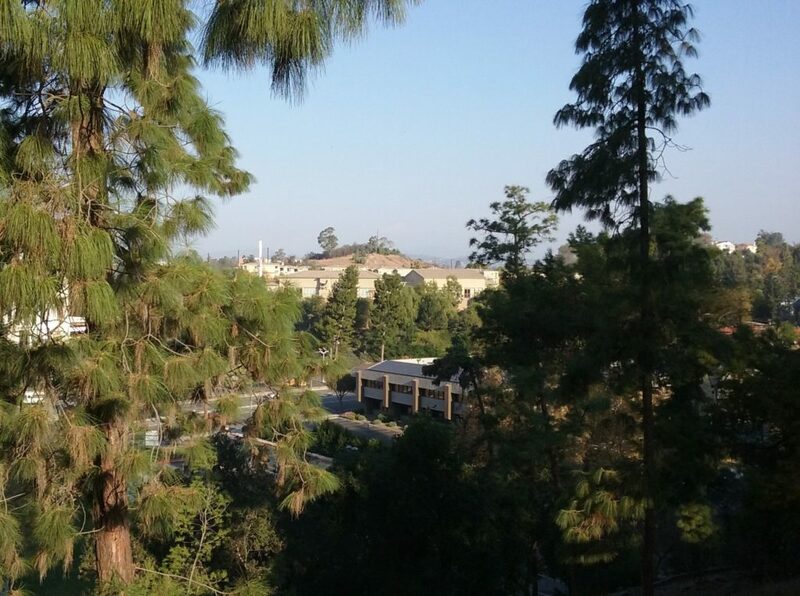 Fullerton has hills; more than most cities. As the city grew, Fullerton Water Department was able to hide all of them between the hills that Fullerton has so many of. Believe it or not there’s nine of them. Some of these can be seen up close in the various walks described in this website. The water tanks are all connected to each other with 12” pipes under the roads and water is pumped between them to keep them all full. These lines are independent of the main lines also under the roads. Pumps are only on the lower tanks and push the water uphill to keep the upper ones always full. The upper ones can feed the city by gravity for about 2 days if for some reason all the electricity is cut off. There is a water tank in Hillcrest Park that is very well hidden. Unlike any other water tank, the top has three of dirt so it can be part of the park. This tank is fairly new (1992) and replaced one that was about the same size, which at the time it was built was large enough to be called a reservoir. The view would be fantastic but it has been completely blocked in all directions by trees. So being on top means nothing yet it is rarely used for playing on either. A view of Brea Dam and its spillway. This photo was taken on the trail that leads up to the cellphone tower. 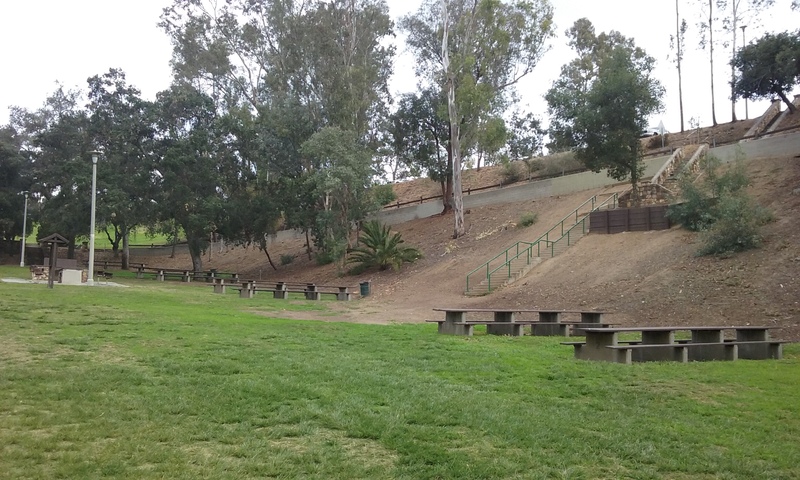 Out-and-Back to Brea Dam Spillway (2.2 mi) Hillcrest Park is obviously noted for it being a hill. The hill rises steeply on all sides except to the east where it remains high beyond Lemon. It would be wonderful if there were a trail to the east but even the roads are not conducive to that walk. 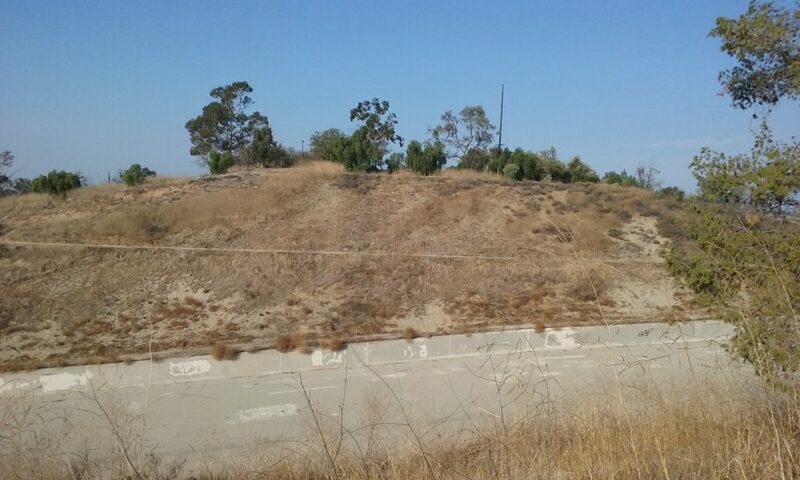 There is only one trail that leads out of Hillcrest Park and that’s to the Brea Dam and its spillway. The trail is to the north which can use any of the Hillcrest Park parking lots as a starting place. The south most lot is the easiest to get to and has no gate. From Harbor go east on E Valley View. That’s across the street from Ralph’s. There’s also a lot on the corner where Brea Blvd pulls away from Harbor. This is right next to what used to be the duck pond. This lot has the best access to the dirt trails of Hillcrest Park and always has spaces because it is so hard to get to. The only safe way is to get to it, is to find your way going north on Harbor and take the right onto Brea Blvd but immediately slow down for a turn to the right. Path to Brea Dam spillway. Note the well defined trail leading out of Elks Way. Elks Way is the road in the bottom-center of this Google Earth satellite view. Notice that the trail seems to disappear for a while. It then picks up again on the left side of a fence that goes up to the cellphone tower. 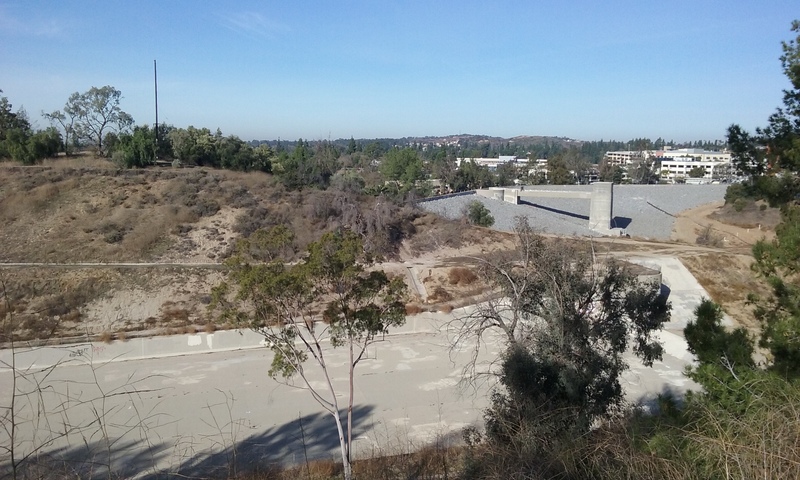 To walk to an incredible view of the spillway and dam itself from the “duck pond” parking lot, jay walk across Brea Blvd. (Or walk a long block north to Lemon and cross there at the signal.) Find your way to the road that goes past the Elks Lodge. The trail entrance is hard to describe. See map in the picture gallery below. The trail entrance is on the right and for the next 100 yards your are surrounded by irrigated scrub oak. 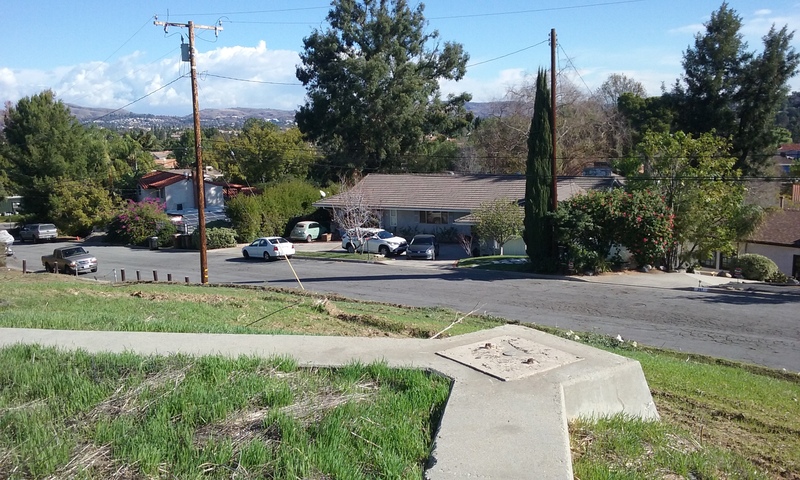 The goal here is one of the highest points in Fullerton. There’s some radio antennas (just beyond the fence) that mark the exact highest point. On the trial, but before you get there you will have a wonderful view of the spillway and of the Brea Dam itself. The view there is a very worthwhile goal. 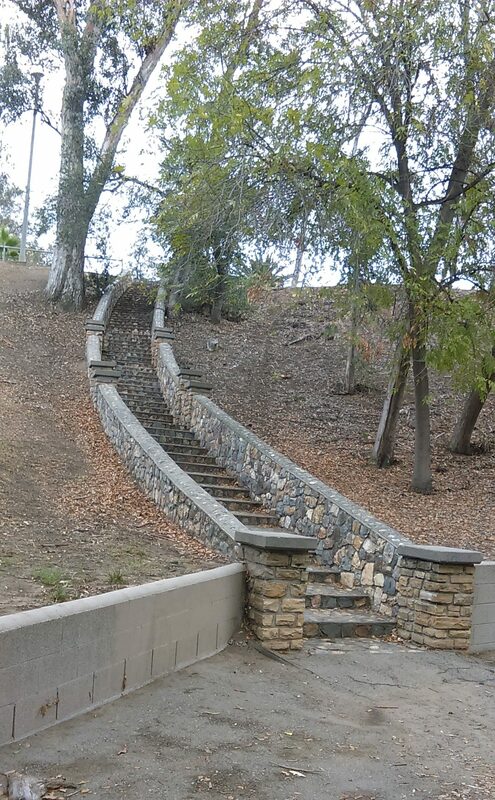 Take the flagstone stairs to the right as you walk into the park from the south parking lot. 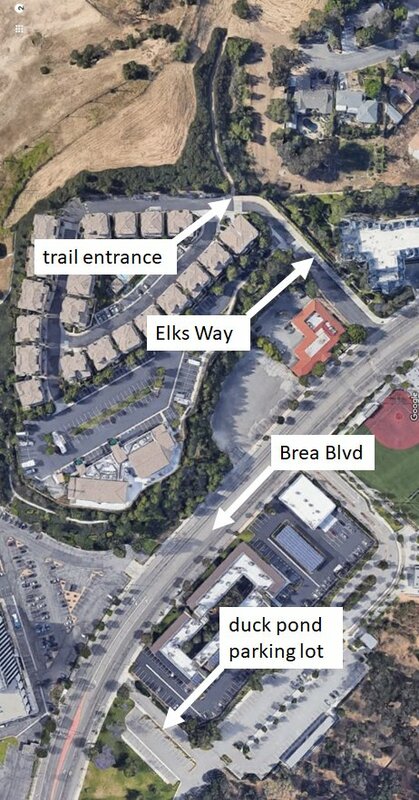 Detailed Directions Through the Park and Across Brea Blvd From the south parking area, walk into the park and take the flag stone stairs to the right. Follow the paved road as it curves to the left to where you can see Harbor. 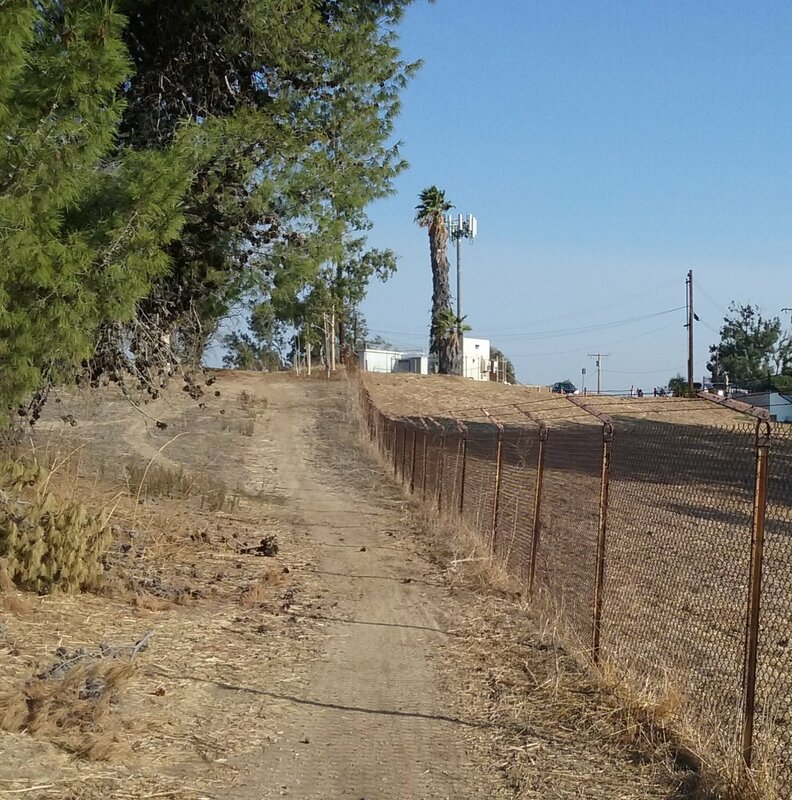 The dirt trails are on the North West side of Hillcrest Park. So watch for a dirt trail that makes a very sharp right turn in that direction. That trail is a lot of fun and in places fairly steep but with wood steps half buried to keep you from sliding. 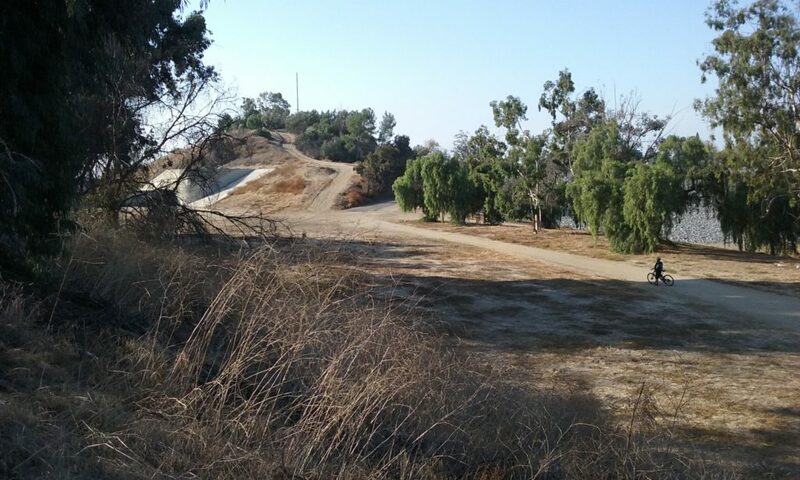 This fun dirt trail can take you down to the duck pond where you are on the level of Brea Blvd. You can find you way across the street there, and then east to Elks Way. Or you can continue the walk on dirt which becomes the groomed sand trail under the exercise stairs. That trail follows Lemon down to Brea Blvd. Cross the street there at the signal and walk south a block to Elks Hill Way. Walk up this access road about a half block to the entrance of a well warn and carefully maintained trail. The trail widens to what can only be described as unused land. It’s not clear who owns it but the county cuts the weeds yearly. You will see a rusty fence with a rusty open gate. 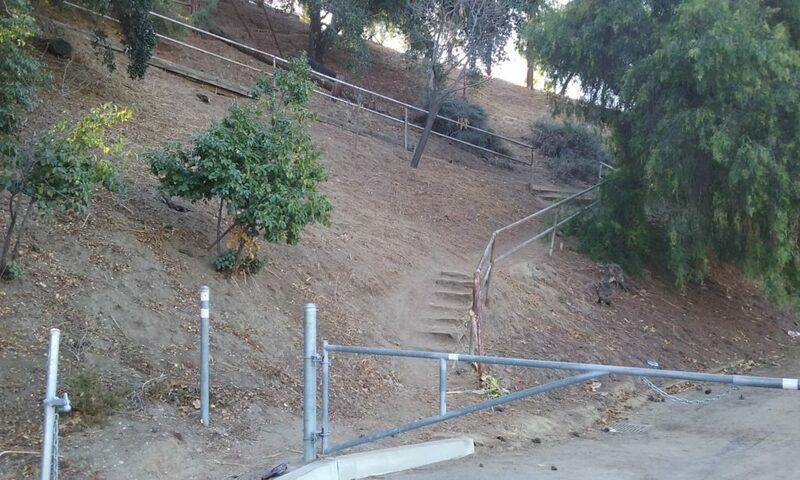 Pass through that and just go up hill. 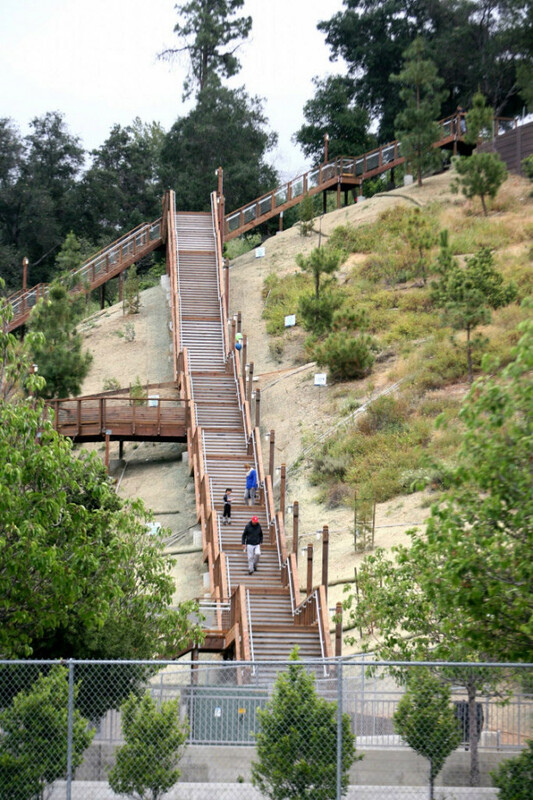 It is easy to see where to walk to get to the best view of the Brea Dam spillway. The interesting thing about this trail is that is it one of the few that is so well warn, yet doesn’t show up on any map. There might be some politics involved with why this trail isn’t more visible. (It really should be part of the Fullerton 11 Mile Loop because it would take the bikers off of Harbor Blvd.) The out and back from the south end of Hillcrest to the view of the spillway is 2.2 miles. Antennas on top of the hill above the spillway; your destination. What Else to See The dirt trail above Elks Lodge has several opportunities to explore both before and after you find your way to the top where the radio antennas are (see photo to the left). You may recognize the familiar cellphone tower. There are other radio services there; mostly repeaters for mobile units such as fire trucks. Some are abandoned in place as cellphones make private short wave radio communications obsolete. On the trail side of the fence near the antennas is a concrete slab that may have been the base for an older antenna tower. Another theory is the base of a cable supported basket that are associated with dam construction. Standing on that puts you in the highest point for many miles around. Across the valley which is the spillway, is another high point of land and a derelict antenna. 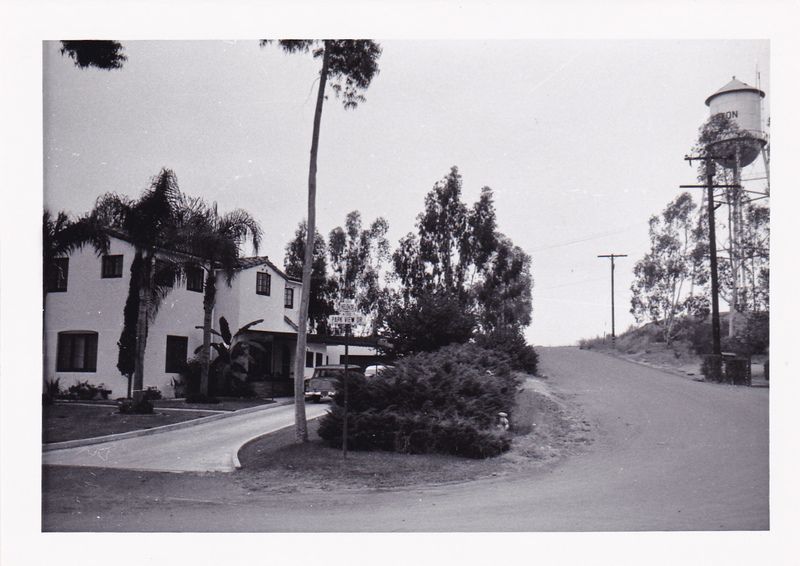 It used to be the favorite spot for Field Day of the Fullerton Radio Club. This is where they would put together temporary antennas draped over the trees so that from this high point they could contact other hams around the world. If you find your way to that point before turning back, it’s an additional .6 miles to the 2.2 miles. It’s better view of the Brea Dam from this hill. The dam is a magnificent site because of its size and considering how invisible it is from anywhere in the city that surrounds it. It is 1,500 feet wide, seven stories high. 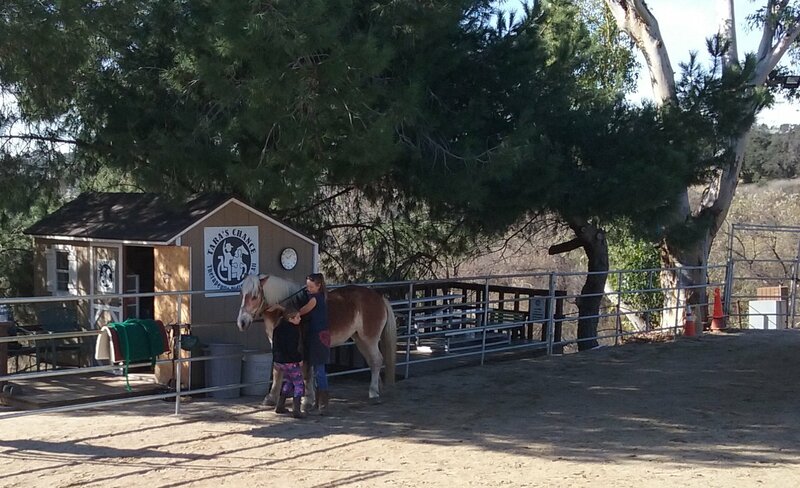 Coyote Hills Ranch and Taras Chance; therapeutic riding, Saturday mornings 11:00 AM. From the highest point where you had the best view of the spillway, the trail continues to the edge of the dam itself or the flood basin below. The larger trail that goes down into the flood basin leads to probably the most worthwhile goal of any trail: The Coyote Hills Horse Ranch. For details on that goal, click here–> Lost Trail. Round trip to there from Hillcrest adds more than a mile to the 2.2 miles. Map for getting to the dirt trail from the duck pond parking lot. One of three 1931 flagstone stairs built as a WPA project. The entrance to the dirt trails of Hillcrest Park are right next to the “Duck Pond” parking lot. The only known picture of the Fullerton Water Tower located to the east of the Brea Dam spillway. Archaeological remains of that tower. From Brea Blvd, go up Marion to Park View then Helen Drive. The Brea Dam spillway with the top of Brea Dam “Park” rising above it. The top of Brea Dam “Park” with an abandoned radio antenna on top. From Hillcrest Park, a view of your destination: Brea Dam “Park” abandoned radio antenna. Same exact bridge over the duck pond… only 60 years later and . . . without the ducks and the green, but a lot more fences. The dirt trails of course would be avoided, but there’s plenty of sidewalks and road ways to walk and they are no problem after a rain. The familiar warn areas in front of the stairs stay as mud for several days after a rain. The dirt area in front of stairs can be fixed almost for free by installing some stepping stones that are flush with the hard packed dirt. There should be three rows radiating out from the stairs. These would be used only when the area is wet. The top of the wood stairs has redwood bark which is excellent to walk on when wet. All you need is a thicker layer of them right before the stairs start. As to the stairs themselves, where there is dirt instead of bark, that dirt is tracked in on the stairs which makes them seem a bit slippery. Where it is clean water, I didn’t notice the slipping. For some reason going upstairs the slipping isn’t noticed. At the bottom where there’s fine sand, it still tracks the finer particles up the steps. Perhaps all that’s needed is a few more wood planks where it’s level to allow the dirt to rub off there.